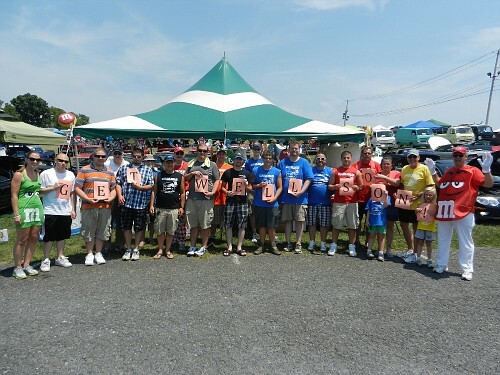 Carlisle 2012 - Final recap! Thanks to all that have been posting about what a great weekend we had at the All Chrysler Nationals in Carlisle. Sorry this is a bit delayed! Here's an official run down of the weekend for those who could not join in the fun! Thursday started pretty early for some as the travel to Carlisle began. Hank already having experienced car trouble was not to be counted out and arrived to transport food in his 300C rental. Goofy and Goody Sr. arrived to our new hotel first and scoped it out. Not only was it clean, but they had cookies in the lobby for all to enjoy! A mid afternoon lunch with 14 friends was a great way to start! Some afternoon shopping and last minute errands lead the group to dinner at Fudruckers. A meet would not be complete without a late night in the parking lot sharing laughs, stories, and drinks! Here, it was officially decided by John that sleep at a 300M meet is optional and certainly a luxury! This would prove to be true as the weekend continued! Friday was our first day at the show field and required lots of set up for our M&M theme. The life-size characters were hung on the tent posts, and handmade garland was strung around the tent. Balloons were tied to the tent, welcome sign displayed, trophies set up, and Ms lined up! A relaxed breakfast was enjoyed and the heat was turned up! Saturday started at 0'dark thirty with a group...yes, a group of people! Craig and Tyler fresh in from Ohio, Robert and Bob scrubbing away, and others trickled in for the day. A delicious themed breakfast of M&M pancakes was enjoyed and again, the heat was turned up! We hit 109 before the day was over!! Thank goodness for Charlotte and Gwen, Bill and Colleen's girls, who has spray bottles to cool everyone off! Our annual club dinner at the Fire House had a huge group if people and it was so nice to have the entire upstairs to ourselves! While Seth and Tyler tormented the waitress, all dined on Duck Cakes (except Alan) and enjoyed a delicious meal. An exciting raffle left all with prizes and club awards were distributed. Converging on the hotel parking lot for the Sight and Sound competition - 4 GREAT competitors each with impressive setups!! Again, the voting was close but found Keith winning by one vote. To top it off, the group gathered to enjoy a LED lit cake and toast to John Wyche with precious. The night was not over until Alan's car was wrapped up for bed....literally with a roll of cling wrap! Sunday morning was quiet in the parking lot and as we all rolled into the show field a bit more exhausted the showfield winners were announced. It was great to support both the 300M and LH category as they took part in the parade. Our groups was certainly the loudest and nice to have all winners take place in the parade. Congrats again! As the group began to depart some major packing of the cars took place to be sure our tent was cleaned and all items had a home! Many thanks to all again for helping to transport various items throughout the weekend (and back home - Jimmy!). The contributions of all really made the weekend a success! All in all it was another outstanding meet! We had 4 new members join the club over the weekend, took a get well group photo for Ron's wife, managed to entertain some with Bob and Lindsey's M&M costumes and Mike's outfits, and share in many laughs! It was a great turn out of club members - the regulars and some of the news young guys! It's always great to expand our family at meets and we look forward to seeing you all next year!! Re: Carlisle 2012 - Final recap! I SO can't wait till next year!!! That waitress was clearly flirting back. She gave us free drinks. Great time it was indeed! Lindsey, it really wasn't Stans Birthday, we set him up for throwing paper and messing with the laser pointer! 02SilverSpecial wrote: Great time it was indeed! You do realize she sat at the table with us, and heard the whole plan and knew it really wasn't Stan's B'day right? Glad I was a memorable part of the table Bobby!! Thanks for explaining me Scott!!! Here's the picture....sorry for the delay!!! I've uploaded a few of our pics to the Fotki Carlisle 2012 folder but wanted to post this one here for all to see! (faces from left to right) Lindsey (Lindsey), Craig (Trpnician), Bobby (02silverspecial), Stan (swalker), Jimmy (no forum name), Hank (Mnitetrain), Alan (alandw), Mike (BigMike60), Scott (IS300M), Craig (300Maximilien), Will (Squilliam), Robert (LUNAT1C), Tyler (300MaximuM), Bill (YardlyBill), Keith (SilverSpecial), Seth (FutureM), Dave (Goofy Sr.), Charleotte (Bill's daughter), Cindy (Goofy's M), John (BeeSpecial), Gwen (Bill's daughter), and Bob (FIREM)!! Fine picture, but unfortunately there's no link to download full-size source file for it. Maybe it's something with the club's Fotki account? Fotki is not going to keep the full size images anymore unless we pay for it. I will be looking for alternative solutions to fix this soon. PM me your email Igor and I will send you the file. silverspecial wrote: Fotki is not going to keep the full size images anymore unless we pay for it. Then maybe it'll be good to change the default 'big' photo size in album settings to 1000x1000 and re-download all photos? Wow...I just got that message today! Now I have to figure out how much the costs are involved? Time to switch companies maybe. I remember signing up for another service and there was an option to allow all photos to be tranferred over to the new service. Maybe we might want to look into something?? To make our service better, we will not be storing your photo originals (those are huge files you upload from your cameras). We will keep only version of the photo for screen viewing, which takes much less space (just like most other places where you upload photos). Users who still want to keep their originals on Fotki, can add this feature for a very small monthly fee, which you can activate in My Account. If you don't activate this service, it will mean that you don't want us to keep your originals and we can delete them. I need my photo originals (Fotki will host your photo originals, at 8 credits per GB/month (about 6 cents per GB/month). Now that I looked over my personal account on Fotki it looks like they took it upon themselves to reduce the file size on all my stored photos from large 1Meg+ files to 500x375. This is kinda sad since I don't have many of the files anymore.